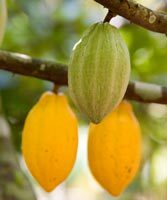 Cocoa is a small (4–8 m tall) perennial tree crop that primarily comes from three tropical regions—Southeast Asia, Latin America, and West Africa. Côte d’Ivoire is the single largest producer of cocoa, accounting for approximately 31% of the world’s supply. Other leading cocoa farming countries include Brazil, Cameroon, Ghana, Indonesia, and Nigeria. Though a tropical crop it does not like the sun and grows in the shade of other important crops such as banana, oil palm, and rubber as well as fruit trees such as avocado, breadfruit, guava, mango, orange and coconut. The fruit is an egg-shaped red to brown pod that contains 30 to 40 seeds, each of which is surrounded by a bitter-sweet white pulp. When the seeds are dried and fermented in the sun they are brownish red, and known as cocoa beans—the principal ingredient of chocolate. The first recorded evidence of chocolate as a food product goes back the Mayans and Aztecs who made a drink from the beans of the cocoa tree. Chocolate was known as a beverage until the nineteenth Century when “eating chocolate” was made. After roasting, the beans are crushed in a machine and ground into cocoa powder. Cocoa has a high food value as it contains as much as 20% protein, 40% carbohydrate, and 40% fat. It also contains theobromine, an alkaloid closely related to caffeine and phenols and flavenoids, antioxidants that can inhibit cancer and cardiovascular diseases. Cocoa beans are a good source of potassium, magnesium and iron. The crushed shells or pod husks of cocoa beans can be used as a cost-effective, organic fertilizer to help in suppressing weeds, conserving moisture, and minimizing erosion. Cocoa is essential to the livelihoods of 40 – 50 million people worldwide, including over 5 million smallholder cocoa farmers who grow this valuable crop. In 2011, trading volume of cocoa futures on the Intercontinental Exchange (ICE) was 4.95 million tons, exceeding production by 750,000 tons. In November 2011, global sales of chocolate confectionery crossed US$100 billion for the first time, with consumer demand for chocolate anticipated to continue increasing and possibly outstripping supply. Usually, cacao trees start in a nursery bed where seeds from high yielding trees are planted in fiber baskets or plastic bags. The seedlings grow so fast that in a few months they are ready for transplanting. The cocoa pods are unusual in that they grow directly from the trees trunk and major branches. With care, most cocoa trees begin to yield pods at peak production levels by the fifth year, which can continue for another 10 years. Ripe pods may be found on cocoa trees at any time, however, most countries have 2 periods of time per year of peak production. A farmer can expect 20 – 50 beans per pod, depending on the variety. Globally, there are many hundreds of insects and pathogens recorded on cocoa. Of these, only a fraction is economically important, and diseases, rather than insects, are the biggest pest problem. Black pod is an important fungal disease in Africa, responsible for estimated losses of about 44% of global production every year, and attacks pods at all stages of their development. Cocoa swollen shoot virus (CSSV) in Africa is transmitted by sucking pests, mostly mealybugs. Insect pests Cocoa capsids in West Africa are the most important insect pests; in outbreak years losses can be up to 75%. Pest and disease management in cocoa has been heavily reliant on chemicals but most farmers cannot afford to treat their cocoa, or make only one or two applications a year. The vast majority of cocoa farms are not owned by the companies that make chocolate products or supply cocoa. Cocoa is grown on millions of small (1-2 ha) and medium-sized (4-5 ha), family-run farms worldwide. It is a highly labor-intensive crop. It is an important cash crop providing income to more than 4.5 million families worldwide, yet the families who grow cocoa face challenges. Farmers must contend with severe crop loss due to disease, aging tress, outdated farming techniques, and limited organizational support. Many farmers have virtually abandoned their cocoa trees, only investing the bare minimum of time and money to maintain the crop. This neglect has exacerbated many pest and disease problems such as cocoa capsids, cocoa swollen shoot virus (CSSV), and black pod disease. Chocolate consumption is growing faster than cocoa production and this has implications for the smallholder farmers who produce the cocoa. In Africa, growth in the cocoa sector has been achieved by increasing the area cultivated rather than by improving yield leading to the near disappearance of the West African rainforest. The challenge today is to enable the farmers to have a viable living whilst protecting the environment. Our objectives are to improve the economic and social well-being of smallholders and the environmental sustainability of tree crop systems in West and Central Africa to contribute to agricultural growth. Our scientists have pioneered farmer field schools (FFS) on cocoa in Côte d’Ivoire, Ghana, Nigeria, and Cameroon. This participatory training approach encourages farmers to make their own discoveries about management practices, to reduce their dependence on costly inputs such as pesticides, and to improve their understanding of crop and pest management. Through the FFS, farmers learn about biological processes and interactions in the cocoa agroecosystem. This knowledge allows them to become “experts” in their own fields and to make sound management decisions.